The new VRF Cloud Gateway by Cool Automation seamlessly integrates VRF systems with smart phones, tablets, or any similar wireless device as well as home automation controls systems. This simplifies monitoring and control as VRF systems can be managed through the same interface as lighting, security and other home systems. It can also be used as a stand-alone device with information accessible over the web. And, it comes with the peace of mind that it has been thoroughly tested by the team at Johnson Controls. Monitor and control equipment from a laptop, tablet or smartphone anytime, anywhere. 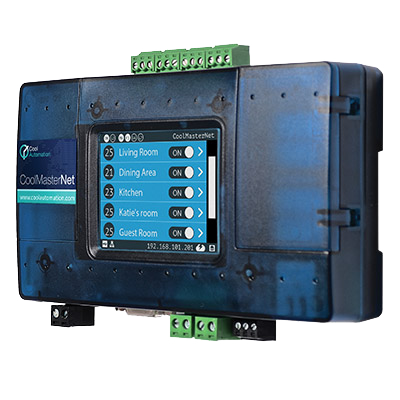 Manage and control Indoor Units through simple touchscreen display. Install and integrate with ease (true plug-and-play device). Interface through RS232 (ASCII), RS485 (MODBUS RTU) or Ethernet (ASCII & MODBUS IP).